The Oysters fin de Claire Trio teased our palate. The turn of the season calls for something refreshing yet vibrant, and The Clan Restaurant delivers on all these fronts with their new Summer menu. Tucked away at PoMo, the swanky dining club exudes an enigmatic presence complete with cushy armchairs and soft jazz playing in the backdrop. But once you’ve gotten over its posh and slightly intimidating outlook, a thoughtful spread of modern European cuisine awaits. My culinary journey began with the quintessential summer broth, Chilled Gazpacho ($14), served on a bed of ice. Smooth and tangy, each chilled mouthful was a welcoming respite. Next, the Oysters fin de Claire Trio ($22) teased our palate with a trio of freshly shucked and naturally sweet oysters served three ways — au naturel, topped with salsa and finally, sake. 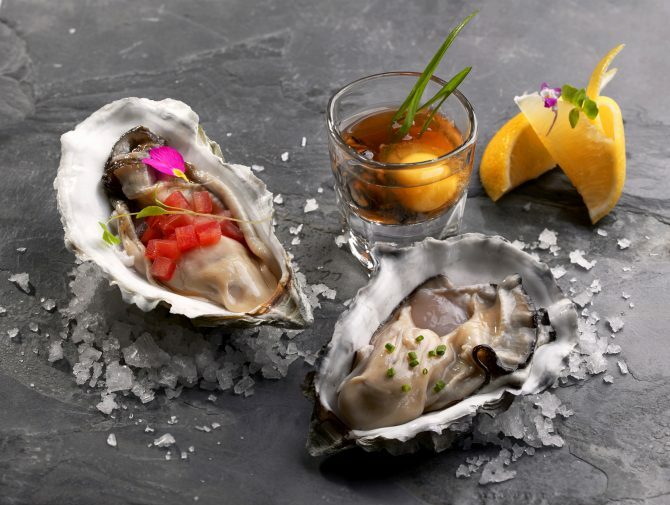 The heady shot of sake amplified the light and briny flavour of the oyster while the salsa added a hint of zesty sweetness. The Wagyu Beef Loin on Hoba Leaf is a perennial favourite. For mains, we insisted on sampling the perennial favourite that was Wagyu Beef Loin on Hoba Leaf. It’s not hard to see why this item remains a menu stalwart, especially with its tender, succulent slices of beef, which gained an intense smokey flavour from being seared atop the hoba leaf. New mains like the Pork Jowl and Lamb Rump got my dining companions’ nods of approval. And if your appetite allows, the succulent Halibut ($38) paired with chorizo stew is worth saving space for. Sweet endings came in the form of Matcha Yuzu. Sweet endings came in the form of Matcha Yuzu ($20). The beautifully plated dessert came with a molten matcha lava cake, which flowed nicely into the mess of yuzu curd and quenelle of lemon sorbet. It left a lingering, tart sweetness on my tongue, and I almost wanted a second helping of it. For its sensible prices — 3-course lunch menus start at $38, The Clan makes a convincing case for elegant dining, no matter the occasion.